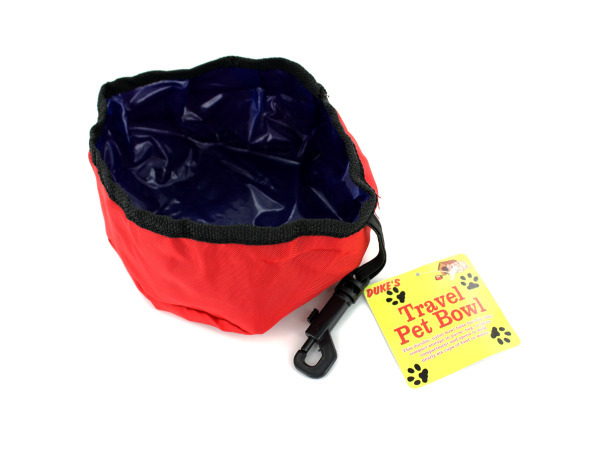 Perfect for pet owners that are on the go, this durable polyester and waterproof plastic Travel Pet Bowl folds flat for easy storage in purses, bags or glove compartments and opens to hold nearly four cups of food or water. Convenient design features a plastic latch for clipping to key rings. Directions for folding are on back of card. Measures approximately 6.5" in diameter and 2.5" deep. Comes packaged with a hang tag.